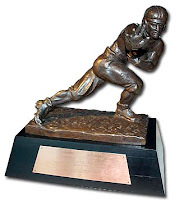 LynchyRightNow: Quack, Quack, Mr. Heisman ? 3. TIM TEBOW, QB FLORIDA -Those who know me, know I still refuse to recognize Hawaii quarterback, Colt Brennan, in my top 3, or any player representing the WAC . I'm a big conference, big game voter (even though I can't actually vote) and with 3 losses I do consider Tebow to be at best #3 on the radar for the elusive trophy. Tebow's 18 touchdown passes and impressive 176% QB passer rating while playing in the toughest football conference week-to-week keeps him in the hunt. Tebow, only a sophomore will most likely be considered a Heisman candidate next year as well, but this year he will have to do some major number padding to get the Heisman commitee to ignore those 3 SEC losses to Georgia, LSU, and Auburn. Tebows (x) factor, the opportunity still presents itself to Florida to advance to the SEC title game if Georgia loses home games to Kentucky & Auburn and the Volunteers from Knoxville choke Arkansas & Kentucky. He'll need Cialis like help to finish off his bid but a late season run by the Gators could push Tebow even closer toward the trophy. 2. DENNIS DIXON, QB OREGON - Can anyone stop Dennis Dixon? To go along with his 16 TD tosses and rediculous 69% completion ratio Dixon also boasts 8 rushing touchdowns to bring his total to 24. Impressive? I'd say the 39-7 road drumming of Michigan and 24-17 toppling of USC at Eugene is pretty impressive. Last week Dixon applied nearly 80 yards on the ground and 160 through the air against what at one point this season was considered the best defense in the country, USC. I'll give credit where credit is due, my buddy Roche has been calling for more consideration of Dixon for weeks now, and he has it. I don't consider this a huge test for Dixon, at home against #4 ranked Arizona State, partially because the Sun Devils are over rated at #4 and will most likely get torched by at least a touchdown, but Dixon will be able to include them as a late season notch on his Heisman belt. Dixons (x) factor, he's been on the radar for all west coast voters throughout the year, but his numbers will seemingly put him on the map of east coast voters as well, 2000+ passing yards by years end to go along with his 600+ rushing yards. Nike, time to plaster Dixon all over times square like you did Joey Harrington & Wizinator, Ontario Smith. 1. MATT RYAN, QB BOSTON COLLEGE - The Hokie defense kept a good QB down, that is until 4 minutes remaining in last Thursdays game of the week. By now you've seen the replays, you've heard the co mparisons, and you know he's had the first Heisman Moment. The ACC isn't the Pac-10 or the SEC, but wins at Blacksburg are nothing to scoff at. If Ryan comes to play with his undefeated Eagles behind him, and plays well in three weeks at Death Valley, you can all but hand him the trophy. Out of the three candidates I've reviewed this week, Ryan trumps them in both passing yards & passing touchdowns, he is competitive in completion percentage and his passing rating is slightly lower. I also think he deserves points for a couple other outside factors here, he is playing in a new system, with a new coach, and his numbers continue to rise, a testament to both him and the new coach. Ryans (x) factor? besides the fact that Matt has displayd why he should be considered among the countrys elite, he has also exemplified confidence after being knocked down, something Heisman voters will look to in December. Keep in mind, despite what those voters say, there is an East Coast bias that exists in this country, and working for Matt Ryan, he plays in Boston.